The professionals at GlassWorks has the skill and experience to really pay attention to all of your glass shower enclosure and glass shower door enclosure requirements. That’s why GlassWorks is known as the ultimate destination for customers who are looking for the finest shower enclosures and glass shower stalls in town. GlassWorks has been renowned as the foremost glass company and installation experts of architectural glass throughout the Greater Chicago Metropolitan Area for more than 37 years! GlassWorks is happy to take pride in our excellent glass shower enclosures and regardless of the kind of glass shower enclosure you desire, we have what you’re looking for. Also, we have been delivering exceptional, award-winning services to the Glenview residents with our wide-ranging selection of glass shower enclosures and glass shower stalls for many years. We have been serving an average of 4,000 customers each year and we will continue to do so! Glenview, Illinois is a village that has around 44,000 residents and it is located approximately 18 miles north of downtown Chicago in Cook County. Glenview is the home to GlassWorks so whenever the residents are in the market for glass shower enclosures or glass shower stalls, they seek out the best which is GlassWorks. The citizens of Glenview appreciate our classy shower enclosures that will also produce a touch of style and comfort to your baths. 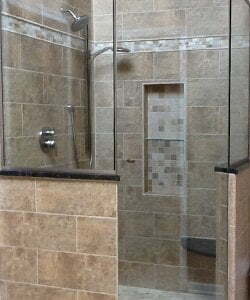 Thus, Glenview residents are very aware that GlassWorks can customize any glass shower stall or shower enclosure so you can have it just how you want it. Our shower glass is often referred to as “safety glass” that guarantees bathers are protected within their reinforced shower glass structure. Likewise, your new glass shower enclosure or glass shower stall will make your bathroom look splendid! Similarly, customers are continuously content with GlassWorks because we provide them with the most economical and within your means costs. From frameless glass shower doors to neo-angle glass shower doors, glass steam shower enclosures, framed glass shower doors and custom glass shower doors, GlassWorks can handle any wish with swiftness and very efficiently. So, no matter what kind of glass shower stalls and shower enclosures you have been searching for GlassWorks’ installation technicians are always there to lend a hand! The experts at GlassWorks are waiting for your call, so reach out to us at: (847) 729-5580 to receive a FREE ESTIMATE! Or for an appointment, complete our online form for a 10% reduction!